"The D.C. sniper is the 'Jackie Robinson' of crime! He broke into the Crazy White Leagues!" 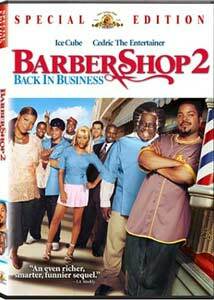 The first Barbershop came out of nowhere to be a critical and commercial hit in the fall of 2002 and represented a great achievement for a comedy. It was a film filled with interesting characters, terrific dialogue and joyful performances, and when a sequel was announced I was skeptical that the magic of the original could be captured again. Thankfully it has been, and this time the magic is even better. Calvin (Cube) is still running his father's barbershop on Chicago's south side and the same group of barbers and customers are still hanging around the shop. Eddie (Cedric The Entertainer) is still going on at great lengths about whatever happens to be on his mind whether it be tactful or not; Terry (Eve) is still alone amongst men and continues to try to prove herself in their eyes; Dinka (Howze) is still pining for Terry, while Ricky (Ealy) is confronted by a woman from the past and Isaac (Garity) deals with being the only white barber in the shop. This time around we are introduced to some new characters including Quentin Leroux (Lennox), a wealthy man who has purchased land across the street from Calvin's and plans to open up a "Nappy Cutz" salon with the intent of putting Calvin out of business. Jimmy (Thomas) has left his haircutting days behind and now works for a powerful alderman, one who could help save the series of small stores that surround Calvin's shop. Another new though only slightly significant character is Queen Latifah as Gina, the owner of a beauty shop that has opened next door to Calvin's. Logic will say that the reason for introducing Gina's character is so that audiences will have an instant recognition when Beauty Shop opens in theaters in November of 2004. The central plot for Barbershop 2 exists more as a framework for the delightful conversations that take place between the characters. As in the first film, Eddie offers the best dialogue, including a rant in which he compares the D.C. sniper to Jackie Robinson; while it seems in bad taste, it is in Cedric's delivery that the line works like a thing of beauty. Rivaling Cedric for overall entertainment value is Queen Latifah, and a barbecue scene in which the pair trade barbs is one of the funniest scenes filmed this year. Overall Barbershop 2 is a much tighter and better constructed film, one that wisely eschews straight orward comedic situations in an effort to add a little drama to the proceedings. As opposed to the first film, there are a lot of sequences that take place outside of the barbershop. While the original film had a subplot involving the theft of an ATM machine that slightly tied into the barbershop, this film becomes more focused on one story line and it works for the better. After the release of the original Barbershop, many people were angered over the brash and unapologetically un-PC comments that littered the script, ones that largely came from the mouth of Eddie. In the sequel, the writers and director have wisely not backed down and the result is just as brash and unforgiving as the original film, at times even more so. Writer Don D. Scott and director Kevin Rodney Sullivan are more interested in the backgrounds of their characters, and by including scenes that focus on the past, we care more for their characters because of this. Image Transfer Review: Presented in a 1.85:1 anamorphic widescreen transfer, Barbershop 2 boasts one of the best video transfers that I have seen recently. Sharpness and detail are each incredibly well done with the transfer boasting a very film like look throughout. The print used boats no scratches at all while colors are nicely done with terrific depth and no bleeding apparent. This is a topnotch transfer. Audio Transfer Review: The Dolby Digital 5.1 mix for Barbershop 2 is largely dormant for much of the film's running length, with only the center channel providing any type of excitement. Dialogue is crisp and clear with excellent depth and crispness while the left and right speakers do little more than offer support for the musical aspect of the soundtrack. The left and right rear speakers are used sparingly with only a few slight ambient sounds rounding out the mix. Extras Review: Two commentary tracks are offered, the first with Sean Patrick Thomas, Cedric The Entertainer, and Jazmine Lewis (a video track), the second featuring Kevin Rodney Sullivan and producers Robert Teitel and George Tillman. The video track is largely a bore; the actors struggle by offering small stories about shooting, though too often they seem to get caught up in watching the film and forget to discuss their experiences. Given the inclusion of Cedric The Entertainer, I was hoping for something that was informative and absolutely hysterical, but you don't always get what you want. The second track is far superior to the first in that it delves much further into the making of the film. The trio discuss the rigors of making a sequel and creating new ideas, as well as coming up with all this within a short period of time. This is a lively discussion on the making of the film and is worth a listen. Six deleted scenes are offered with optional commentary and, for the most part, the scenes that were cut from the final version are deserving of inclusion in the finished product—there are several huge laughs to be found in this collection. A six-minute collection of outtakes are also offered and the collection is typical of what can be found in most. A laugh here, a mistake there, and nothing that is entirely funny. Music videos are included for Not Today by Mary J. Blige and I Can't Wait by Sleepy Brown as well as 35 production photos and the original theatrical trailer for the film. Barbershop 2 is that rare sequel that not only trumps the original, but it is funny, touching, and at times offers some serious dramatic punch. Highly recommended.